e know it can be difficult and confusing when researching what your insurance does and does not cover. 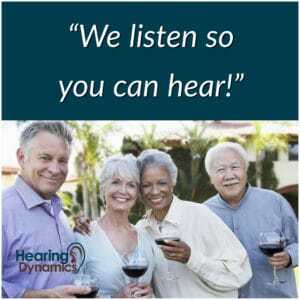 Hearing Dynamics is happy to help you through the process. We participate with most major insurance carriers. Call our office today (520) 378-1212 to determine if your health insurance covers hearing aids. Your health plan may pay a specified amount toward the purchase of aids. This amount may be applied toward the entire hearing aid purchase or it may be allowed per ear. The benefit may renew after a given number of years, usually 3 to 5 years. Your health plan may give you an allowance toward hearing aids if you purchase from a contracted provider. An allowance is a specified amount that is subtracted from the total purchase price. Your health plan may have negotiated discounts with contracted providers. This means that you must purchase from a participating provider in order to get a specified discount off the retail price. We are a participating provider! Hearing Dynamics is a participating provider with most major medical insurance carriers. Hearing Dynamics has got you covered! Since all insurance plans differ, and hearing aid coverage is available on some plans but not others, we will ensure that you receive any benefits for hearing devices that are available to you. Our office staff is incredibly knowledgeable about different insurance plans and will be able to lend guidance and answer questions regarding your specific coverage when you call. Please be sure to bring your insurance cards with you to your appointment. Some retired Auto Workers’ insurances, federal government employees’ insurances and retirees with federal government insurances cover basic hearing aids. Some Arizona State plans include coverage for hearing aids and hearing services. Arizona workers’ compensation may cover hearing aids and hearing services for occupational hearing loss. Some private insurance plans may pay for part or all of your hearing aids. Our office staff will be happy to check your benefits when you come in for your appointment. Please bring your insurance card. For those with medical flexible spending accounts, the costs of a hearing aid and batteries is considered reimbursable. For those with other insurance plans, please call us at (520) 378-1212 for additional information.